The city of Edmonton boasts wide open skies and is bounded by large agricultural prairies. The summer sun and winter lights are renowned, and the city enjoys the second-most hours of sunlight in North America, helping shape the perspectives of Edmontonians. 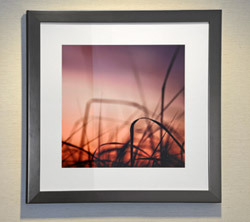 This formed the basis for the overall design concept at the DoubleTree by Hilton™ West Edmonton, with a colour palate of bright gold, deep purples and reds to represent the sky’s natural canvas. Browns are used throughout to represent the region’s rich and fertile soil and the subtle use of glass and steel is a nod to the city’s urban edge. The lobby introduces the hotel’s design concept with splashes of red and gold upholstery and dark wood panels, creating a rich and inviting space to welcome guests. Bright yellow panels and an abundance of overhead lighting recreates the large open skies Edmonton is known for. The new restaurant, Stages Kitchen & Bar®, builds on the lobby’s design concept, with rich aubergine furniture and lavish dark wood panels to evoke a feeling of excitement and richness. The bar itself displays splashes of sunshine yellow to add to the lively atmosphere. Public spaces, such as the corridors and elevators, are designed to connect guests with city and the rest of the hotel. 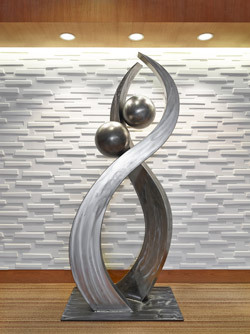 Staying true to the design in the lobby, restaurant and meeting spaces, the concept of skies and fields is cheerfully displayed with artwork of Edmonton’s ever-changing and colourful skies and the natural light show of Aurora Borealis, as well as the surrounding farm land stretching out from the city limits. A proud and active sports city, Edmonton’s river valley represents the longest stretch of connected urban parkland in North America and is an outdoor space where locals enjoy outdoor activities throughout the seasons. 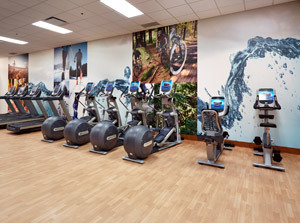 The fitness area reflects this local sports and outdoor culture, using a mural of the river valley as its central piece. 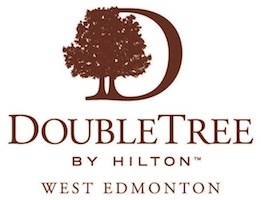 The conference centre blends the natural beauty of the prairies with the man-made brilliance of the city, with a particular emphasis on Edmonton’s striking architecture and bustling business district. 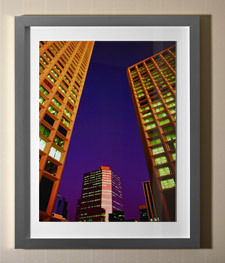 Detailed photography captures unique features of prominent downtown buildings including City Hall, Legislature Buildings and the Art Gallery of Alberta. Specifically, the images showcase Edmonton as the capital city of Alberta, a major financial hub and the heartland of Canada’s oil and gas industry. The images also illustrate the city’s expanding infrastructure as well as its thriving cultural and performing arts scene. 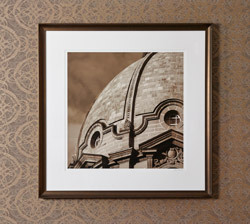 Inspired by the City of Edmonton’s metropolitan ambiance, the guest rooms have a sophisticated and urban feel with the warm silver tones paying homage to the glass and steel of Edmonton’s city centre. 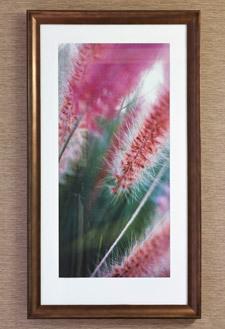 Accent colours of rich aubergine mirror the design concept throughout the hotel. Soft furnishings and carpets create a sleek and modern impression, finished off with a crisp and refined tiled bathroom.